Share of commercial banks in outstanding G-Sec was around 40%, while investment of SCBs in these bonds was about 82% of total investment by end of FY17. Struggling with stressed assets and muted credit growth, the banking system has consistently deepened its balance sheet with exposure to sovereign bonds. The Reserve Bank of India (RBI), therefore, recently warned them about their holding. Acharya cited three important factors which have made banks to adapt more of bonds in past few quarters. Firstly, exceptionally accommodative monetary policy in advanced economies, coupled with a general post-crisis fall in the risk appetite of global investors, created a natural demand to hold sovereign debt of safe-haven economies. Secondly, under Basel capital regulations for banks, sovereign bond exposures continue to attract 0% risk weight in home countries and some currency unions, besides not being subject to concentration limits. 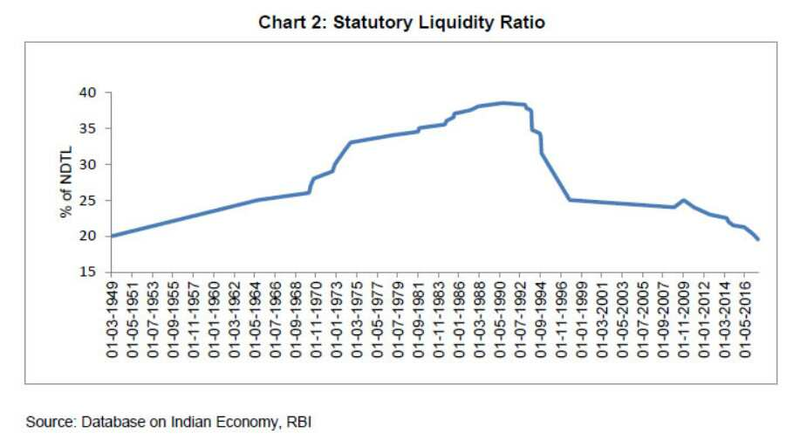 Thirdly, the liquidity coverage ratio (LCR) under Basel-III requires banks to hold High Quality Liquid Assets (HQLA). Though there are other securities eligible as HQLA, the cost and ease of holding are the most attractive for sovereign bonds. Under Section 42 of RBI Act 1934, a bank is required to maintain minimum liquid assets (basically government securities – both Central government securities or G-Secs, and sub-sovereign securities called State Development Loans (SDLs)) as a percentage of Demand and Time Liabilities (DTL). Data provided by RBI highlights that such ratio has historically been as high as 38.5%, but has gradually come down to 19.5% now, being brought steadily in line with international levels of the LCR under Basel-III. 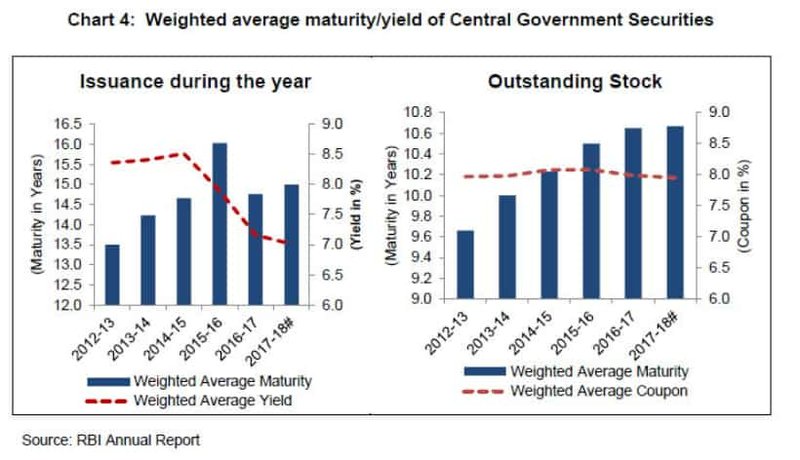 Acharya stated that large holding of G-Secs and SDLs by banks expose them to re-pricing of governments’ borrowing costs which could rise due to inflationary, fiscal or other domestic as well as global macroeconomic developments. As of June 2017, share of commercial banks in outstanding G-Sec was around 40%. While investment of SCBs in these bonds was about 82% of total investment by end of FY17. Public sector banks (PSBs) are slightly higher at 84% in total investment. This exposure has noticeably increased since the year 2014. Investment portfolio of banks is classified in 3 categories currently - 'Held to Maturity (HTM)', 'Available for Sale (AFS)' and 'Held for Trading (HFT)'. One of the important reasons behind such holding would be excess liquidity in the banking system, which did not end up being parked at the RBI’s liquidity mop-up operations which would have kept duration risk minimal, explains Acharya. 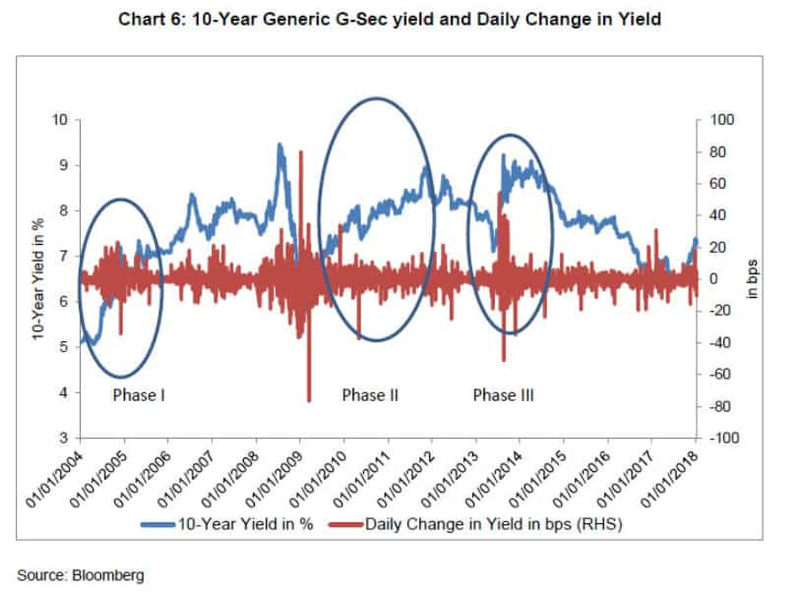 Instead, the surplus liquidity found its way into G-Secs as domestic sovereign debt as most attractive investment for capital-starved banks looking for short-term gains even if at the expense of greater duration. Moreover, the weighted average maturity of the stock of G-Sec has increased to 10.67 years in FY18 compared to that of 9.66 years in FY13. Also, average tenor of annual issuance during the last five years has been high at around 15 years. Given the muted credit growth over this period, especially at PSBs, Acharya explains that investment income has again started playing a rather important role in determining bank earnings. RBI warns bankers that they should know and understand this risk rather well, as interest rate risk of them cannot be managed over and over again by their regulator. “It would be better for the banking system to build its own immunity and strength, i.e., emphasise internally ¬¬– and put in place processes for – efficient management of interest-rate risk,” he said, while urging the banks to "pay greater attention and devote more resources to their Treasury operations; and, lay out some options available to banks for managing the risk efficiently."